Episode in the Orlando Philharmonic Orchestra's 20th Anniversary video series, chronicling the orchestra's history in Central Florida. This episode features an interview with Mark Fischer, General Manager and Principal Horn. Topics in the video include the orchestra's performance for the television program Seaquest DSV and community involvement in the OPO. Mark Fischer received his education in music from the University of South Florida and studied the horn with the Philadelphia Orchestra and the New York Philharmonic. From 1975 to 1993, Fischer performed as Second Horn and Fourth Horn for the Florida Symphony. A founding member of the OPO, Fischer has been serving on the Orlando Philharmonic Board of Directors since its inception. He was also appointed to the position of Principal Horn in 1995 and the position of General Manager in 1997. Finally, he has performed with the Minnesota Orchestra, the Grand Teton Festival Orchestra, the St. Paul Chamber Orchestra, the Jacksonville Symphony, the Naples Philharmonic, and the Florida Orchestra. The Orlando Philharmonic Orchestra, located at 812 East Rollins Street Suite 300 in Orlando, was inspired by the closing of the Florida Symphony in 1993. The orchestra performs in more than 125 concerts each season. In June of 2013, the Philharmonic made plans to purchase the Plaza Live, located at 425 North Bumby Avenue in downtown Orlando, for office space, a rehearsal hall, a music library, and a music hall. In celebration of the Orlando Philharmonic Orchestra's 20th Anniversary season, this video series chronicles the orchestra's two decades of history in Central Florida. This video was produced by Joe Gennaro, Timothy G. Brown and Lisa Mills with the guidance of Stella Sung and Emily Lindahl. Original 2-minute and 37-second video by Joe Gennaro, Timothy G. Brown, and Lisa Mills: "The Orlando Phil's 20th Anniversary | Mark Fischer, General Manager & Principal Horn." Orlando Philharmonic Orchestra, October 3, 2012: Orlando Philharmonic Orchestra, Orlando, Florida. Original 2-minute and 37-second video by Joe Gennaro, Timothy G. Brown, and Lisa Mills: "The Orlando Phil's 20th Anniversary | Mark Fischer, General Manager & Principal Horn." Orlando Philharmonic Orchestra, October 3, 2012. http://youtu.be/JuWfWsuguCE. Orlando Philharmonic Orchestra, Orlando, Florida. Multimedia software, such as Adobe Flash Player. Application software, such as Java. Originally created by Joe Gennaro, Timothy G. Brown, and Lisa Mills and published by the Orlando Philharmonic Orchestra. Copyright to this resource is held by the Orlando Philharmonic Orchestra and is provided here by RICHES of Central Florida for educational purposes only. "Orlando Philharmonic Orchestra." Orlando Philharmonic Orchestra. http://orlandophil.org/. "Orlando Philharmonic Orchestra." YouTube. http://www.youtube.com/user/TheOrlandoPhil. "Mark Fischer - Orlando Philharmonic Orchestra." Florida French Horn Festival. http://www.floridahornfest.com/artists. Well I think one of the—one of the events that stands out as we started out as an orchestra was, uh, a result of our willingness to do almost anything. And, um, Andy Lane,  who was the manager at the time, uh, received a call from a production company wanting to use an all-male orchestra dressed in, uh, boxer shorts to film a dream sequence for the, uh—um, the television show seaQuest [DSV]. We, uh, performed in the Lake Eola Bandshell, with the actor Roy Scheider on the podium. And, uh, Mr. Scheider was watching Andy Lane, who was behind the orchestra—not one camera—and was mirroring his motions as a conductor. And so we played the music and, um—and eventually it made it on to the dream sequence that was part of, uh, Roy Scheider’s character, uh, in the television show. And when we did that I thought, Okay. Well, we just moved the boundary a little bit, and I think, um, we’ll see what comes next. And, you know, there—there are no boundaries apparently. I think what amazes me most about the success of the Orlando Philharmonic [Orchestra] over the years is the extent to which it’s been embraced by people in the community. People have, uh—members of the friends of the Philharmonic would volunteer as board members, have really gone the extra mile over the years to help sustain this organization, and to see to it that even in hard economic times that it can—it can flourish. When—when musicians see that kind of commitment to the organization it makes them also more committed. Um, it, uh, gives one a sense of—of well-being. And, uh, that what—what we do as musicians is important. And, uh, and it’s considered indispensable to the community. Gennaro, Joe, Brown, Timothy G., and Mills, Lisa. 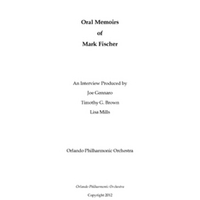 “Oral History of Mark Fischer.” RICHES of Central Florida accessed April 25, 2019, https://richesmi.cah.ucf.edu/omeka/items/show/2284.